The other day we reported that Nokia had introduced a device that many feel was a "Hail Mary"-type long shot in an attempt to turn around the company. Whether or not the Nokia N9 lives up to that role won't be known for many months yet. But Nokia isn't the only manufacturer that needs a hot-selling handset to survive. RIM has recently reported lower than expected profits, seen its stock fall sharply, and has had a couple of key products delayed. One of those products is the BlackBerry Bold 9900. With the same physical QWERTY keyboard from the original BlackBerry Bold 9000 that everyone raved about, and a 2.8 inch touchscreen, this device is expected to not only capture the attention of those BlackBerry users that will always support the latest and greatest 'Berry, but also was designed to grab some attention from Apple iPhone and Android users as well. The new BlackBerry 7 OS might be considered a stop-gap piece of software, installed before RIM switches to the QNX OS it placed on the BlackBerry PlayBook tablet, but it should allow the Bold 9900 to be a contender. Throw in what RIM calls "an elite browser" and you have a phone that could help turn RIM around. 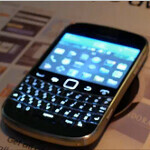 In an extremely brief video, the BlackBerry Bold 9900 shows off its NFC capabilities. The feature, which RIM has promised will be on all new models, allows one to use a handset to pay for items in the same way that you might use a smart card or a credit/debit card to make a purchase. And while the video is way too brief, at least it gives us a chance to view a working model of the device that could be RIM's savior.